For those who haven't seen this, the "real-time" Debt Clock is quite astounding. The US politicians fight over things that in the end will make no difference in the long-term budget situation. It's surprising for example that the federal pensions are about as large as the US net interest payments on debt. 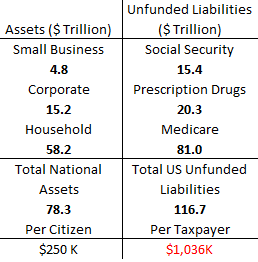 But the saddest portion of that table is this basic balance sheet of current assets vs. the unfunded liabilities. The liabilities are over a million dollars per taxpayer. One can take this clock back in time or even look into the future based on CBO projections or at the current rate of growth. It is also possible to do it by state as well as observe the situation globally. Typically, I find the posts on this site of a very good standard, but this is not one of them. So many holes, I don't know where to start. Where's the logic in comparing 'current assets' with unfunded liabilities? Why not include the national parks as an asset? How about valuing the constitution? Those unfunded liabilities don't 'fund' those particular assets. What about funded liabilities, why not include those assets? Yada, yada, yada.. There's so much hype & hysteria around this subject, this 'analysis' doesn't help. Familiarise yourselves with the Flow of Funds Accounts please. The reader is correct. The only reason for the table above is to better display what is shown on the bottom of USDebtClock.org. And for those who are interested, here is the Flow of Funds Accounts.